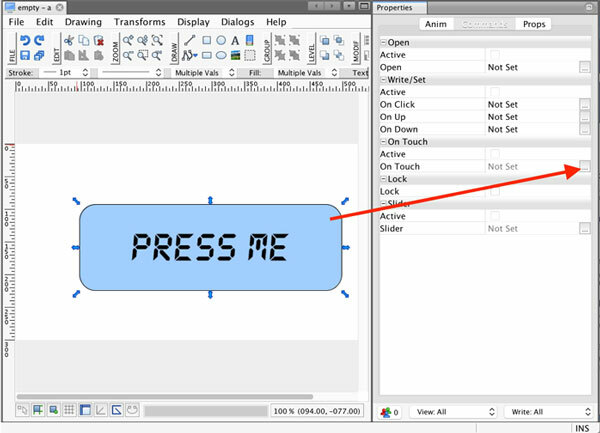 To use an On Touch event on elements in View, please select the element you want to use as your On Touch trigger. Then navigate to Properties -> Commands. Now click on the On Touch “…” button. The first option is the “Target ID”. The target ID specifies which graphical object you wish to apply settings to during the touch event. 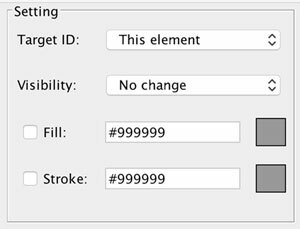 If you want to apply settings to the same element as your graphical object, please leave the option This Element. Next, parameters control visibility, Fill, and Stroke color of the given object. As you can see, you can create a simple scenario like changing the fill color of an object during a touch event, or you can create a complex scenario involving multiple different objects.